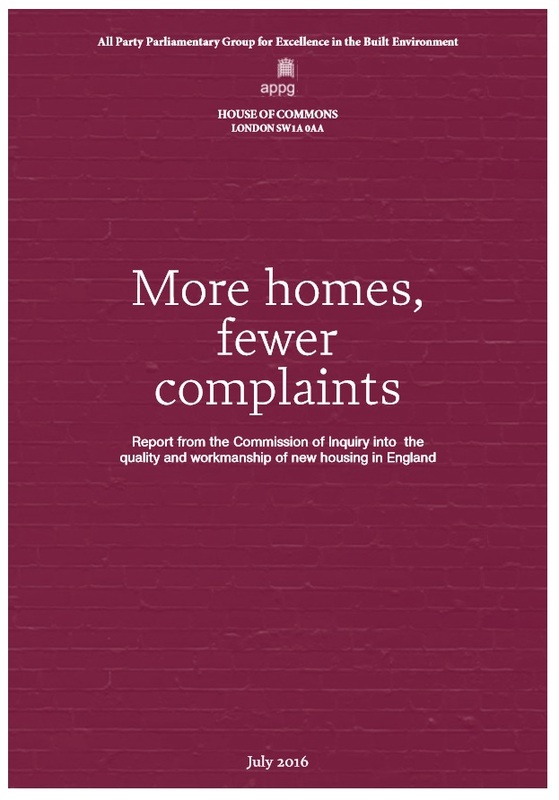 The APPG Inquiry Report strangely titled: “More homes – fewer complaints” paints a damning picture of an industry that has and continues to, fail new homebuyers; a broken industry in dire need of mandatory regulation. It confirmed as was suspected at the outset, that “as the number of homes being built increased, the quality of new homes has declined.” A more suitable title would be “more quantity – less quality!” As housebuilders are only concerned about numbers, the poor quality of UK new homes is nothing new. As I have stated in previous articles, the housebuilding industry talks big, over-promising and repeatedly under-delivering all ends up. 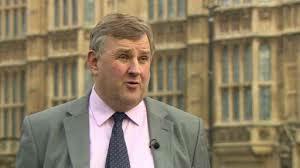 This extensive, in-depth APPG Inquiry and its findings leave this in no doubt whatsoever. It is my view that this will not happen without mandatory regulatory intervention. The house building industry does not do anything that will inevitably eat into its bottom line unless it is forced to, often kicking and screaming, by legislation and government direction. 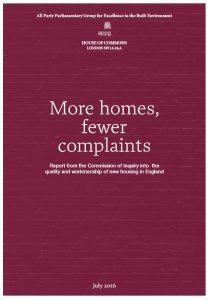 This Report and its ten recommendations would go a long way to improve the quality of new homes and redress the imbalance currently in the housebuilder’s favour, giving consumers greater protection with better cheaper and easier forms remedy when disputes arise. I will be writing to all 650 Members of Parliament by e- mail to ask that they add their support and lobby the DCLG for the Report’s Number 1 and “key recommendation” that the DCLG initiate steps to set up a New Homes Ombudsman at the very earliest opportunity. Indeed, the Inquiry Report contains a great deal of the evidence presented during the session I attended, resulting in 8 of the 10 Report recommendations. Clearly there is much room for improvement. This Report is a damning indictment on a largely unregulated broken industry. A morally vacuous profit driven cartel, indifferent to its customers and only kept alive on taxpayer-funded state life support. I will examine and comment on the Inquiry Report recommendations in detail in my next article along with other measures that perhaps, have been overlooked that could and should have been included. This entry was posted in New Homes, Snagging and Quality and tagged APPG Inquiry Into Quality of New Homes, Consumer Code for Home Builders, HBF, new home warranty, new homes ombudsman, quality. Bookmark the permalink.